I have a darkroom in my house. Uttering that phrase in the company of another photographer always elicits some measure of interest, surprise or envy. I thought I would take a little time on the post today to give you a tour of the darkroom, and explain my own path to having one. I began to think of photography as more than just a curious pastime after I got back from a 6-month wander through South America and took my 23 rolls of undeveloped film into Spectra Photo in the East Village to get them processed. Before I left on that trip—in December of 1999—I purchased my first 35mm camera, a used Chinon semi-automatic. I had no formal training in photography, particularly in the technical realm. I didn’t yet know how to maximize the functions on my camera to deal with available light, or how to creatively manipulate shutter speeds and apertures and focal lengths. I learned the basics of operating the internal light meter in my Chinon, and had a rudimentary familiarity with everything else. My primary asset was an enthusiasm for the quality of a black and white print, and the intuitive recognition of interesting composition. I’ve always assumed that I honed my instincts for placing the picture within the frame through years of working on stage in live theatre. The interior view of the “false wall” that took hours of meticulous light-proofing. Upon getting all of those negatives processed and printed into 4×6 proofs, I learned a couple of things: first, I discovered that I was capable of taking some really fine photographs—getting the light right was mostly a matter of luck back then, but many of the images revealed an intuitive ability to frame a story. I apparently possessed what many of my friends and influences called, “a good eye.” I still consider many shots from that era to be some of my best film captures. The second thing I learned was how bloody expensive my new obsession could be. Never mind the thousands of dollars one can spend on gear (especially in the new digital age and era of accelerated obsolescence); the amount of money it cost me to process and print 23 rolls of film back then blew me away. So, the seeds were planted. But I knew, even at the time, that I couldn’t rush photography, either as an artistic or a career pursuit. There was a ton of learning to be done, a lot of shooting, a checklist of techniques to master. (In truth, there is never mastery. I’m pretty sure Ansel Adams has a quote about that somewhere, too.) I also knew that the acquisition of proper professional gear was going to take time. The tools and chemicals of the trade. And somewhere in there was birthed a dream—though I had yet to actually set foot in one—of someday having a darkroom of my very own. Over the course of the next several years, I gradually acquired more tools to help me in my pursuit. I bought my first Nikon camera, a 35mm film-format D200. I bought a cheap flash and a wide angle lens and started to play with those. I did a lot shooting in the streets of New York City, a pretty good place to cut your teeth as a beginning photographer. I also enrolled in a few courses each year at the International Center of Photography, and it was there that I got into the darkroom for the first time. This cabinet that I got for cheap at the ReStore had a built-in bread drawer. I painted the inside black and voila—paper safe. The onslaught of the digital age was well under way, and had been since the mid-90’s. Though the darkroom and film lab facilities at ICP (I have to be careful when using this acronym in casual conversation because people often think I’m referring to the Insane Clown Posse) were still world-class, it was clear that most of the professional training was beginning to emphasize the use of digital capture and photo editing software. I knew this. Everyone saw the writing on the wall. Public darkrooms—places where you could go and pay an hourly rate to get into a lab and develop negatives or make enlargements—were disappearing all over the city. Nevertheless, it was important to me to lay an analog foundation in my photography education. It’s not that I ignored digital photography. I began acquiring digital cameras and lenses and learning to use Photoshop. But I figured if I really learned and explored the process of making a negative and manipulating it in the darkroom, I would be twelve steps ahead when it came to understanding the digital concepts that are derived from these old methods. Besides, I still loved—and do to this day—the quality and depth of a black and white image made on fiber paper, by hand, in a clean black-walled room, where you can smell the intermingling of chemical processes and hear the steady trickle of water circulating in the print washer. 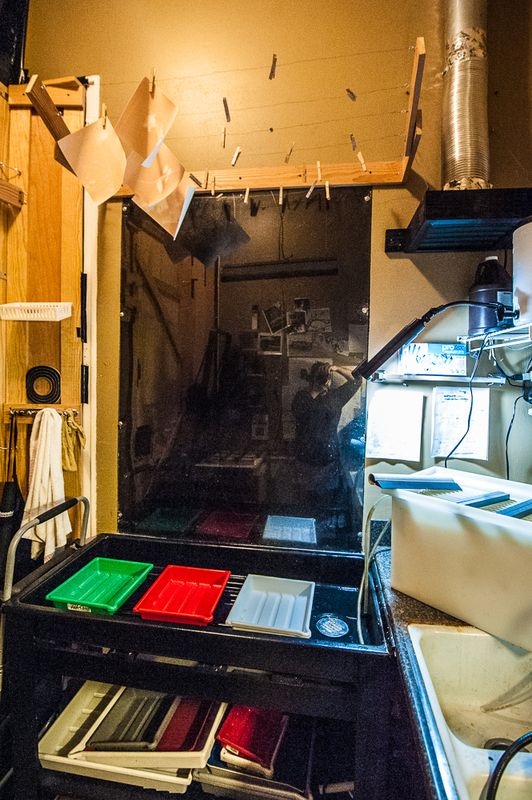 The “wet area”, with a darkroom sink for holding printing trays, a squeegee wall and drying rack. You can see the exhaust fan to the upper right. 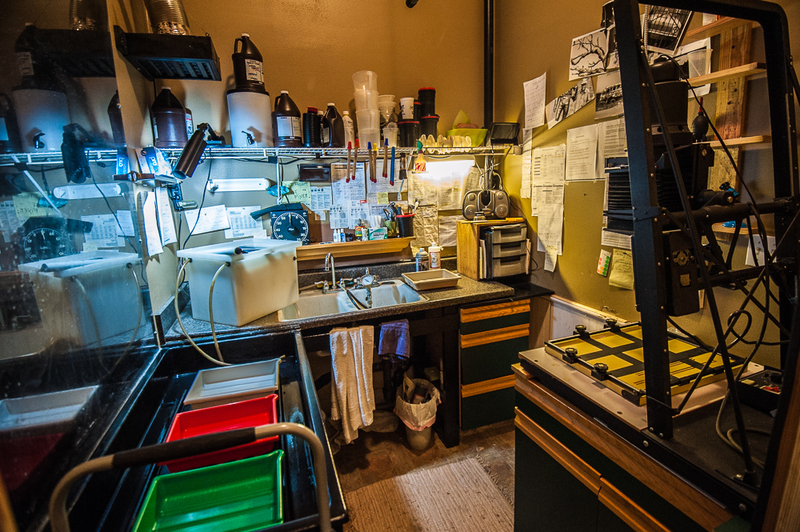 It was really moving from NYC to New Orleans, in 2007, that made the dream of having a darkroom a real possibility. Rent ain’t cheap here either, especially lately, but you certainly get more bang for your buck than I did with the tiny East Village apartment I shared with a roommate. 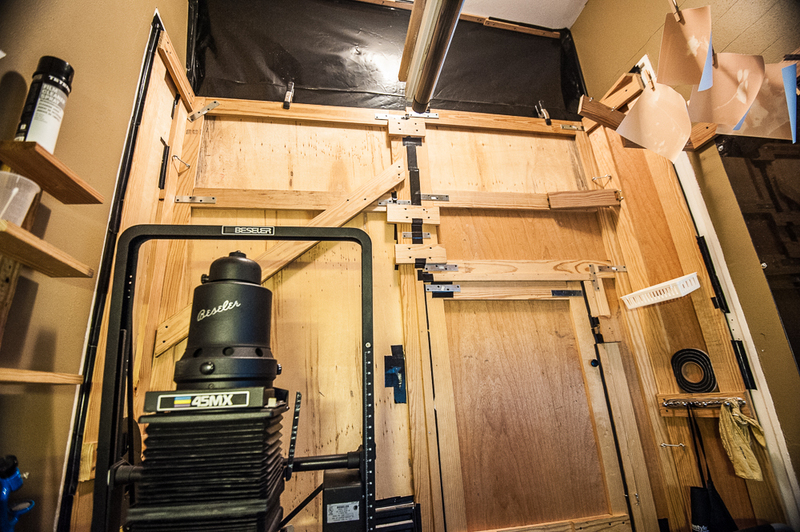 Installing a darkroom, even a convertible one, requires a certain amount of space, and access to plumbing, draining and ventilation. It also must be able to accommodate a virtually light free environment. Even though my first few apartments here did not, at first, lend themselves to those requirements, I began obtaining darkroom equipment and supplies from online and through local sale. You could get all kinds of stuff for pretty cheap on eBay and Amazon, and there are still big houses on both coasts where all manner of specialized analog gear is available, such as Freestyle Photo in Los Angeles and B&H in NYC. I got the centerpiece for my darkroom, a Beseler 45MX enlarger, from a local place called The Darkroom, when they began the process of scaling down their analog services and focusing only on the digital needs of clients. While they were liquidating, I was happily collecting—I also got from them a circulating print washer and some easels—but I still hadn’t the space in my apartment to build a proper darkroom. That all changed when I moved into my current place. It’s a typical New Orleans-style shotgun, but smack dab in the center, between my bedroom and the dining room, was a gigantic walk-in closet. And while at first I imagined it would require some serious plumbing work to reach the pipes from the kitchen and bath at the back of the house, it turned out that my landlord had installed a bathroom on the other side of the wall. The first thing I did was build a (more modest) closet in my bedroom. I have a reasonably-sized wardrobe for a grown man, but it definitely doesn’t require it’s own room. 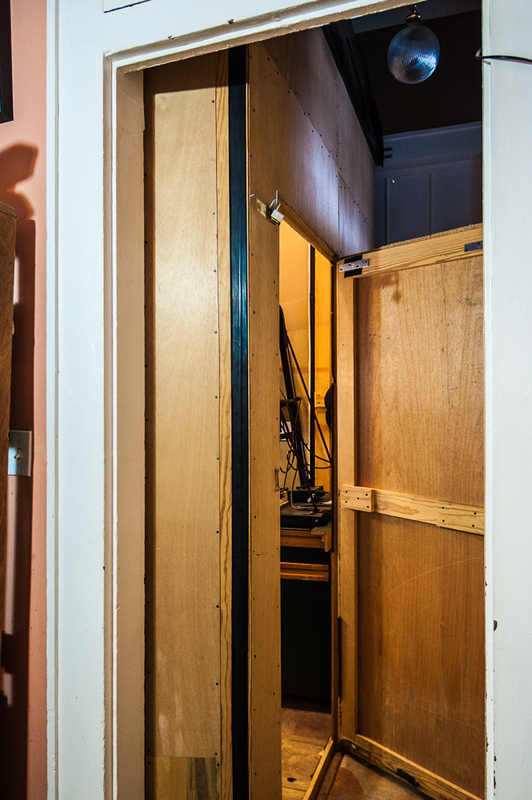 This “false wall”, with door, that I built to enclose the darkroom, creates a narrow hallway for passage to and from the front/back of my house. Originally equipped with hinges for anytime conversion, I never break it down. I removed the shelves and apparatus from the walk-in, built the framework for two sinks, and constructed a new “wall” to enclose the lab. You’d be amazed how difficult it was to get the space completely “light-tight”, as they say. It was hours and hours of standing in the pitch black, waiting for my eyes to adjust to the dark, and discovering all the pinhole leaks that had to be covered with sparkle or gorilla tape. After the physical structure, the main thing was setting about to the “furniture” for the space. 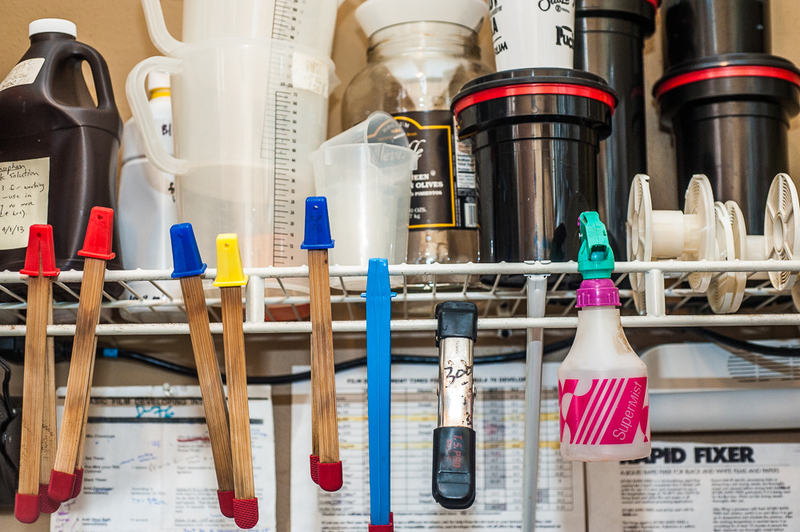 One of the necessary traits of any darkroom is to have some separation between the wet and dry areas, and in my relatively small space, that presented a challenge. I found a proper darkroom sink in Metairie on Craig’s List. A friend gave me an old porcelain double-sink that was sitting in his yard. It took an entire night and a near-hernia to install that heavy, awkward beast, by myself, into a countertop I bought at Lowe’s. 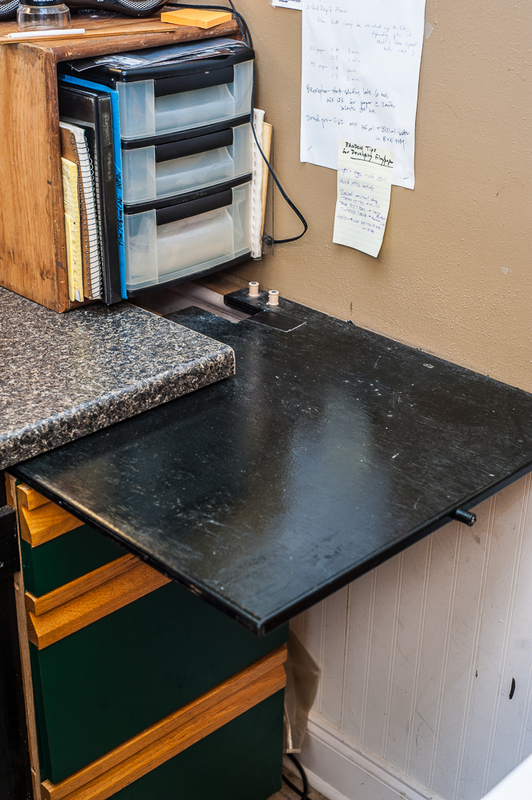 I found a set of cabinets that were perfect for storing paper and supporting the enlarger at a local ReStore. I hired a plumber friend to come over and hook up all the sinks, establish proper drainage, and install a fan vent that ran into the open-air attic so that I wouldn’t go insane breathing in toxic chemicals. (insert joke about my questionable mental capacity here). 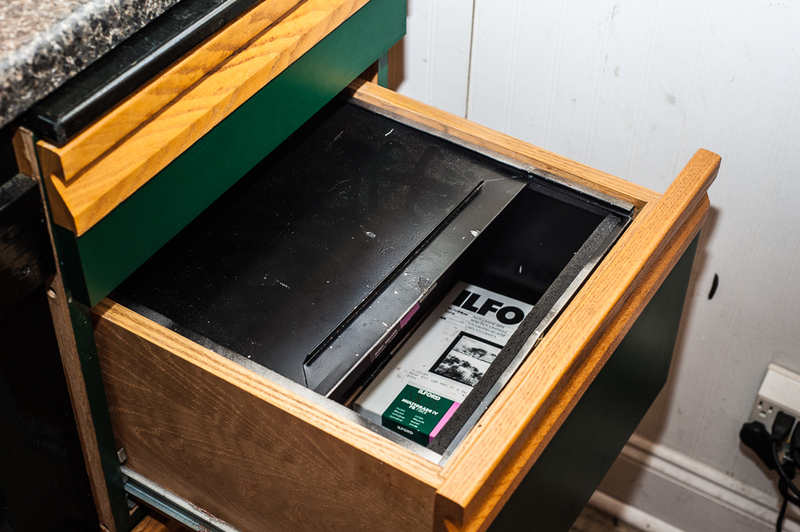 This slide out shelf enables extra space on the “dry side” of the darkroom, for inspecting negatives, etc. Final touches involved painting the room black, constructing a squeegee wall with plexiglass and a drying rack above the printing sink, installing a safelight fixture, and populating my new lab with the accessories and supplies needed to make magic. It has been about four years since my darkroom was finished, and though I don’t get in there nearly as often as I should, it really brings a lot of satisfaction when I do. It’s hard to convey the self-assurance I receive just by standing inside, and feeling some vicarious connection to the living history of my craft. It is like my refuge and my inspiration, and a place of patience and slow reward. I could just as easily (and often do) scan and print my negatives sitting at the comfort of my desk, but I wouldn’t get to have that magic moment when the image begins to take shape on the paper, under dim amber light. And though my work in there is often characterized by tedious precision and exhausting repetition, it is worth it.